Momentum is mass times velocity. It typically uses symbol: "p". Thus, we calculate this object's momentum to be 8.0 kg-m/s. Momentum's dimensions are kg-m/s, pronounced: 'kilogram meter per second'. 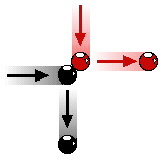 Like velocity, momentum is a vector; it has a magnitude as well as a direction. In fact, they both have the same direction. That is, if an object has a velocity due north, then its momentum will also be due north. However, momentum is both mass times velocity. Momentum is directly proportional to velocity. Change the velocity of an object by a factor of 1/4, then momentum would also change by 1/4. Momentum is also directly proportional to mass. With constant velocity, momentum varies with the mass. Example: triple the mass of an object, then the momentum also triples. Momentum is a conserved quantity. Within a closed system of interacting objects, total momentum of entire system maintains a constant. When object A collides with object B in an isolated system, the total momentum of the two objects before the collision is the same as the total momentum after the collision. Any momentum lost by object A goes to object B. For any collision occurring in an isolated system, momentum is conserved - the total amount of momentum of the collection of objects in the system is the same before the collision a s after the collision. Momentum can be readily observed by watching billiard balls collide. Similarly, high velocity gas goes in one direction, and rocket goes in opposite direction. Action causes reaction. First, we choose to increase the speed of a large space vessel by 10 m/s in one second. Thus, set Vship be a constant 10 m/s. This relates to the approximate value of g = 10 m/s2 acceleration due to gravity near Earth’s surface. Thus, assume our notional spaceship can expel enough high speed particles to increase velocity an additional 10 m/s for every second of spaceflight. The resultant force will simulate Earth-like gravity for ship and contents. 2nd, we further choose to expend one gram of particles in one second. I.e., set mfuel to be a constant 1.0 gram for convenience. 3rd, our thot experiment uses an onboard particle accelerator to give these fuel particles extremely high speeds. Since current devices easily accelerate particles to 99% of light speed, our thought experiment will compare sustainable fuel exhaust velocity, vfuel, to light speed, c. Furthermore, we now choose to name vExh to more clearly indicate exhaust velocity of particles exiting vessel. Finally, we choose to independently vary vExh by incrementally increasing from row to row in the following tables. Thus, vExh is our Independent Variable (IV). 4th, solve for the remaining term, Mship, mass of ship, to determine how much ship can be propelled 10 m/s by a certain amount of fuel mass exiting vehicle at high speed in opposite direction of travel. Since Mship depends on the value of vExh, Mship is our Dependent Variable (DV). Grams and m/s are consistently used on both sides of equation. While above calculations are straight forward, two terms have a lot of digits which might prove inconvenient. We can streamline this process through a conversion contant. For convenience, use a mix different velocity units. In particular, we'd like to continue expressing ship's velocity increase ,Vship, as 10 meters per second; but we'd like to change vExh from m/s to decimal light speed, dc c, where dc is decimal component of particle exhaust speed expressed in terms of light speed. Recall light speed is approximately 300 million meters per second, c = 300,000,000 m/s. Thus, Table-1 proposes example value for vExh of .1 c, 30,000,000 m/s = 10% c. (Note: Disregard relativity effects for now; we'll discuss that later). Consistent values requires conversion constant. Note that VExh has equivalent values in last row of Table 1. and first row of Table 2. For consistent Mship, determine conversion constant K2 such VExh can be expressed as decimal light speed. By definition: 1 mT = 1,000,000 gms; thus, example value of MShip=3,000,000 gms = 3 mT. Changing to mixed units affects the terms: vExh and Mship; thus, unaffected terms (Vship and mfuel) keep the same dimensions. However, those terms (Vship and mfuel) can be usefully converted to rates. Further, we can introduce new term, fuel flow per sec (ffsec), and substitute for the expression: mfuel /sec. Thus, far we've arbitrarily chosen the value of 1 gram per second for convenience, but we will eventually use this term for any value. restate Vship/sec as g, gravity caused acceleration. restate vExh as dcc, decimal light speed. 1. Micro-scale. Spread the amount of fuel ejected in a smooth continuous manner throughout the entire second. 2. Macro-scale. Reliably repeat above item for each of the 86,400 seconds during each day of space flight. Both above items are easily done now in various modes of transportation, but can they be done for particles accelerated to large portions of c, speed of light??? It’s more convenient to express Mship in mT and vExhin decimal c.
Particle velocity, vExh, of .1 c contributes sufficient momentum so that one gram of exhaust particles can propel a 3 ton vessel to an additional 10 m/sec. Since momentum is directly proportional to velocity, increasing vExh another .1 c will propel another 3mT of ship's mass. Recall: mfuel * vExh = Mship * Vship. 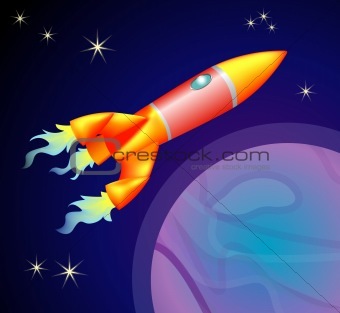 Recall that we set Vship equal to 10 m/s; thus, Vship/ 1sec = 10m/s/s = g, acceleration due to gravity near Earth’s surface. Introduce new term, fuel flow per second: ffsec = mfuel/sec. To continue expressing vExh as decimal c and Mship in metric Tonnes, we'll introduce conversion constant, k = 300/c. Thus, k * vExh = 300 * dc. While this seems like a great way to quickly increase inflight performance, this comes at the cost of enormous energy. It's a fact of nature; it's not necessarily free. Consider a gasoline powered automobile. The fuel converts to energy, but not all the energy rotates the wheels; a significant portion of the energy from the exploding gasoline pushes the pistons and rotates the drive shafe. Eventually, some of the gas's energy results in rotary motion pushing the wheels which touch the road and propel the auto forward. Furthermore, some energy must be diverted for peripheral uses: radio, air conditioning, etc.. However, the essential diversion of energy goes to the auto's generator (or alternator) which converts motion into electricity to the spark plugs which explode subsequent gasoline vapors to produce more motion and so on. We can call this an energy cycle.In like manner, our spaceship's propulsion system must have a similar energy cycle. It must be designed so the system diverts some energy from the accelerator's output to create more plasma and charge the magnets to propel more ions to keep the cycle continuing.Thus far, we've taken the Momentum Conservation equation and applied it for a duration of one second. For space travel to become routine, technology will have to accomplish two things: Micro-scale. Spread the amount of fuel ejected in a smooth continuous manner throughout the entire second. Macro-scale. Reliably repeat above item for each of the 86,400 seconds during each day of space flight. Both above items are easily done now in various modes of transportation, (for example, the typical plane, train, and automobile have done this for many years). However, can micro/macro scale energy conversion be done for exhaust particles accelerated to large portions of c, speed of light??? Note: for current state of nuclear propulsion, see excellent book,Nuclear Space Power and Propulsion Systems (Progress in Astronautics and Aeronautics) by Claudio Bruno(Editor) --------------------------------------------------------------------------------On the other hand, thought experiment further assumes onboard fuel is consumed at fuel's original size. Thus, inflight gross weight of the vehicle will be ever decreasing due to continuous fuel consumption which will be computed by time, t, times original fuel flow, ffsec.